Firefox lovers rejoice! The new Firefox 6 Final version is now available to download. 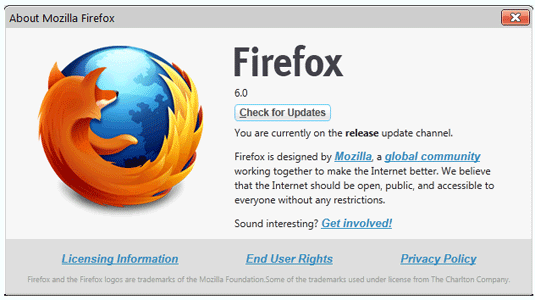 The Firefox 6 Final is not available to download in the public yet, but is available to download via the Mozilla FTP servers. With the new Firefox 6 Final, you’re not going to get any new changes in the UI (user interface) or design. The focus for the new Firefox 6 Final is all about increased speed and decreased processing power. Firefox 5 was only released and available for download back toward the end of June. Apparently, the complaints and uproar over the lack of speed and resource consumption from Firefox finally reached the ears of those who can actually do something about it. Before the “final” Firefox 6 Final is released to the wiles of the Internet, there could be some updates and other iterations, but you can get the full Firefox 6 Final downloads right here by clicking your choice of platform below. And as always, let us know what you think of the new Firefox 6 Final browser.